Here's a pretty, hardback book that would make a great gift for anyone interested in bringing the blessings of the goddess into their life. It is called Channel Your Goddess Energy and has the subtitle Harness the Power of these Ancient Archetypes. The book is divided into five sections: Earth and Creation, Sea and Sky, Sun and Moon, Fire and Ice, and Death and the Underworld. Each includes several goddesses with a double page devoted to their story, correspondences, a short ritual to perform and other ways to honour them. At the start is a little multi-choice questionnaire to help you find your own goddess archetype. Author Kirsten Riddle is a columnist for Soul and Spirit Magazine and Chat: It’s Fate. The book is aimed at the Mind, Body, Spirit and "Pagan Lite" end of the market, but it isn't only about fluffy goddesses, European pantheons or just those that are well known. Along with famous names such as Gaia, Isis, Brigid and Kali, there are deities from all over the world including Africa and Asia, and lesser-known goddesses including Chione, the Greek goddess of the snow (pictured at the top). Publisher Ryland and Peters says on its website: "Goddesses have been a source of fascination for thousands of years. Their ancient mythologies and legends are still relevant today, and by tapping into the power of the goddesses we can find strength and inspiration." It has been a while since I have picked a Bad Witch's Goddess of the Week, so here goes with Chione as depicted in Channel Your Goddess Energy. Kirsten says: "This beautiful Greek goddess of the snow has a sense of fun about her. Myths tell of her sitting in the heavens and sprinkling her snowflakes upon the Earth." Her message is to embrace spontaneity and joy and to find the light in every situation. Her name, apparently, translates as "Snow White". Yet an associated Greek tale of a maiden called Chione shows a different aspect. It says Chione had many admirers, including the gods Hermes and Apollo, but she grew so vain that she incurred the wrath of Artemis the huntress and was killed with an arrow. Life, like winter, can be harsh, but we should still enjoy the fun things that happen and not brood on the bad things. 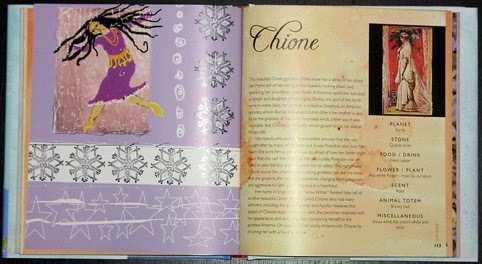 Chione's message is to embrace all aspects of our personality and take joy in nature, even in the chill of winter. The suggested ritual is to wear a sparkly, silver scarf and say: "Like the snowflakes that fall, I embrace the dance of life!" With winter coming and the Yuletide party season too, that sounds like good advice.